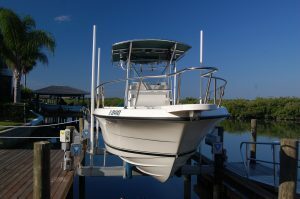 Is a Boat Elevator Right for Your Property in Hudson, FL? A typical boat lift includes a cradle that is suspended between a set of at least four pilings that are driven into the sea floor. However, this configuration requires that the pilings project out from a dock or seawall, which isn’t always possible. For example, in narrow canals or waterways with certain regulations, pilings simply can’t be installed. If this describes your waterfront property in Gulf Harbor or another area of Hudson, Florida, don’t worry – you can still enjoy all the benefits that boat lifts have to offer by turning to DECO Boat Lifts for a boat elevator. Our boat elevator systems are an innovative solution to a common problem. Instead of being suspended between pilings, these boat lifts can be mounted directly to the seawall or to a single line of pilings. Thanks to an advanced design, your boat elevator will provide all the benefits of a standard boat lift. And, when you turn to DECO Boat Lifts, you can rest assured you’ll receive one of the best-performing and most reliable hoist systems in the industry. We offer boat elevators with two distinct drive systems to suit our clients’ unique needs and budgets. Our Maxi lift is an exceptional entry-level system that is capable of hoisting up to 16,000 lbs. thanks to its heavy-duty aluminum flat plate drive. We also offer our Concept CRS Lift, which is the industry’s most advanced. It has a direct drive system to achieve unrivaled lifting power while minimizing maintenance requirements. And, it comes standard with our patented Cable Retention System (CRS) that reduces cable wear by preventing spooling, overlapping, and bird nesting. For more information about the benefits of having one of our boat elevator systems installed at your property in Hudson, FL, contact DECO Boat Lifts today.